I've been following BDJ Box for sometime already but this is my first time to actually buy the beauty box everyone's been raving about. Subscribed last June, and I was informed that I was getting the August box. Yay! So anyway, I know everyone has already posted their unboxing, but it's better late than never, right? 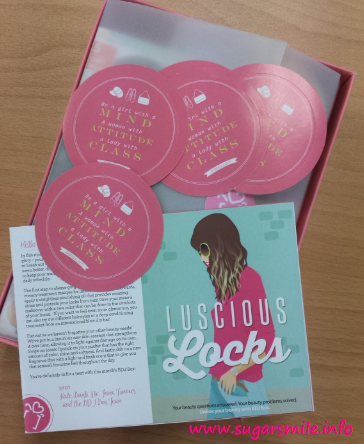 Since I only received the box last Friday, here are the contents of the Luscious Locks Box. 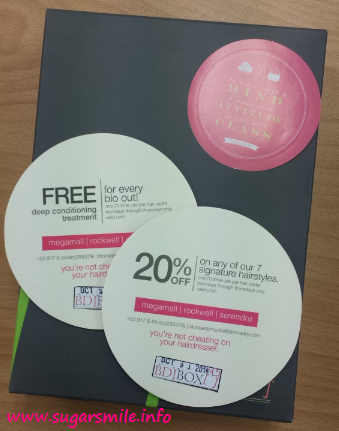 Opening the August box, it welcomed me with a card that guides Bellas on what products are available for the month. It also has stickers that tell, "Be a girl with a MIND. A woman with ATTITUDE. A lady with CLASS". Now that should be our mantra! My hair is one of the features that I'm most proud of. I always tell my friends that it has been untouched by chemicals. I have always donned a long black hair, and I've been getting compliments over the years. I'm just happy that BDJ Box thought of having one for the gorgeous locks. So here goes. 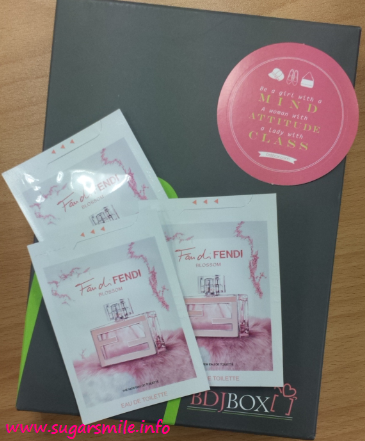 The post card inside the BDJ Box tells about the products inside, prices for its full sizes, and how it works for you. This got me really excited. As I've said earlier, my hair is untouched by coloring products and chemicals. Hopefully, I'd try to use this or give this to my Mom who loves coloring her hair once in a while. This one retails at Php199. Shiseido Ultimune Power Infusing Concentrate, 5ml. 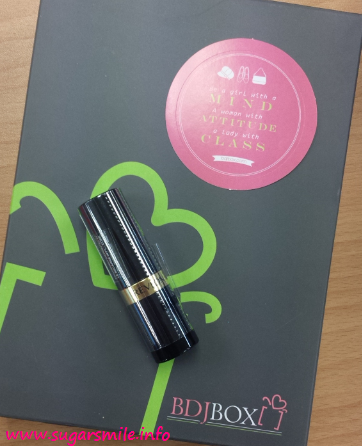 Since I'm not a Golden Ticket winner, I got a 5ml. 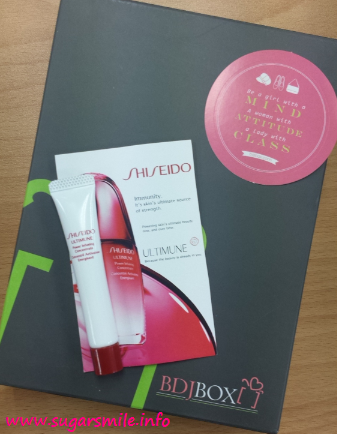 Shiseido Ultimune Power Infusing Concentrate. During Shiseido's workshop at their Megamall Branch, I got to try this amazing product. This is best to have smooth and firm skin. The post card says that using this for one week gives your skin supple and glows with health. Dibs on this one! 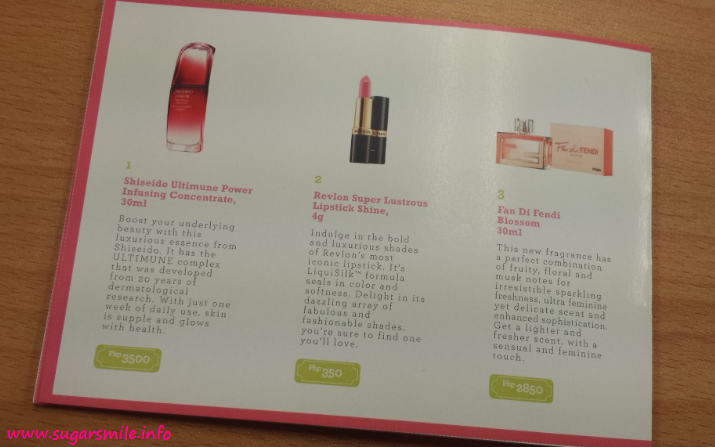 The 30ml Shiseido Ultimune retails for Php3,500. I'm a lover of anything floral and Fan Di Fendi Blossom is a must have. It's scent is not that strong, and doesn't smell pang-matanda. I'm raving on how sweet and feminine it smells like and I believe even the boyfriend would love this on me. The 30ml. is sold at Php2,850. L'oreal Professionel Mythic Oil, 45ml. I've been using one particular product for my hair, and so far, it's working for me. 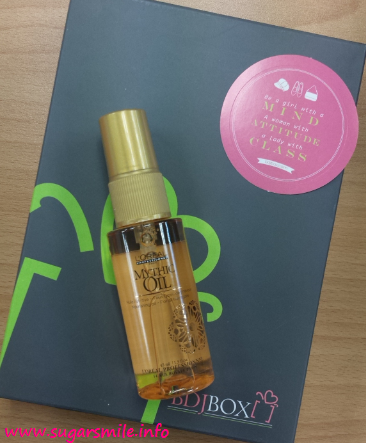 However, one use of the L'oreal Professionel Mythic Oil made me a convert. First of all, it doesn't smell like oil (or of baby oil), it is not sticky when used and it made my hair shiny then and there. The 125ml. is priced at Php995, and I think a 45ml. being included in this month's box is already a steal. Revlon Super Lustrous Lipstick Shine, 4g. Another full sized product, this is priced at Php350. Sadly, I got the Foxy Lady shade and it's brown. The only colors that work for me are pinkish and orange. I guess I'll pass on this one. 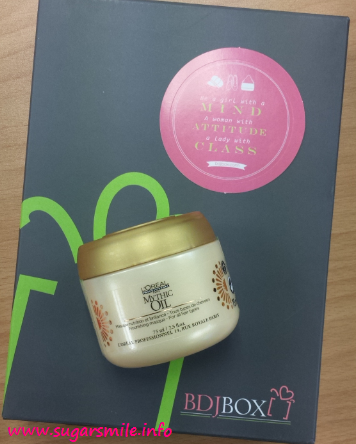 I haven't tried this product yet, but it promises a Paraben-free formula with Argan Oil and Cotton Seed Oil. I remember a former officemate who raves about Argan oil most of the time, we can't make him shut up about its benefits. I guess this is the time I get to see how effective it is, as it tends to deliver intense nourishment and discipline the hair. The 200ml. 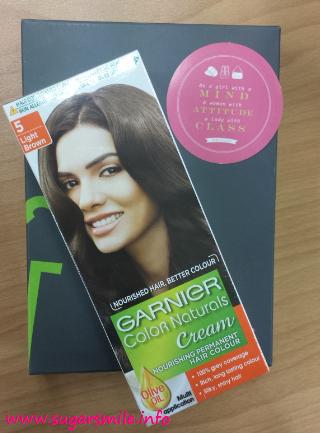 will help your locks for only Php1,095. Have you been Blo'd? Last Valentine's Day, my girls and I went to the SM Mega Fashion Hall to look fab and have a hair blowout. 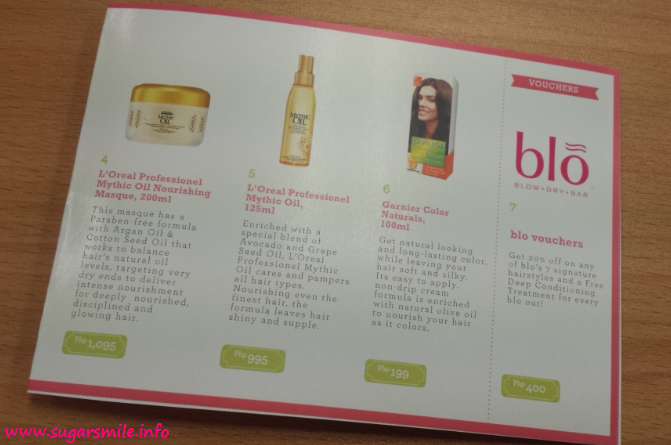 These vouchers priced at Php400 is a great treat if you want to look awesome. So how does my first BDJ Box fare? I say my Php580 subscription fee is already worth it, considering I have 2 full sized items and the rest are helpful for me to decide if I'd buy the full sized product or not. I just wish BDJ could have shipped this earlier because it is already September tomorrow. But if you ask me if I'd subscribe again, I guess I will, and I have already recommended this to my officemates, too. How about you? 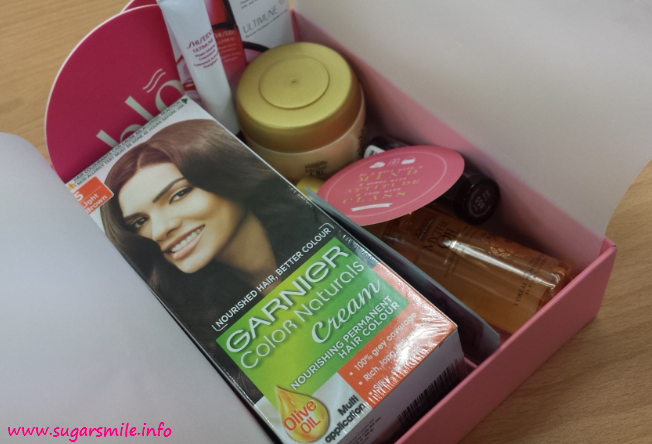 Are you happy with the August Box? 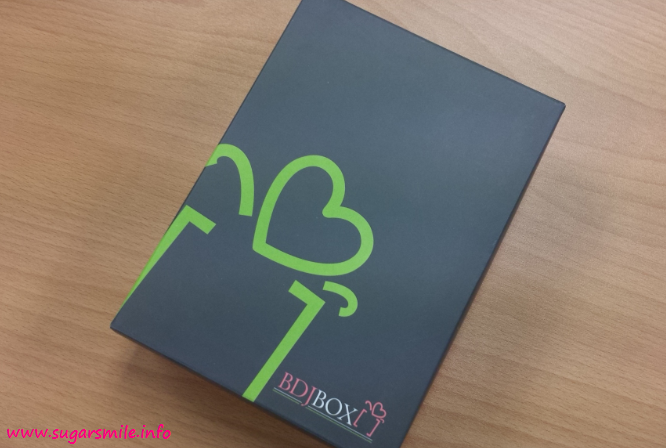 You can go to www.bdjbox.com to subscribe.